I waited too long to start taking pictures. These were taken on Dec 20, 1999 and don't really do the "show" justice. 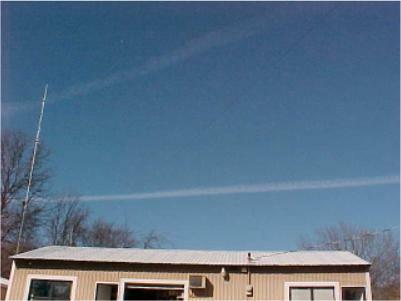 About a month earlier Annie and I were at the local Del Rancho restaurant and when we came out the sky looked like a checker board with chemtrails crossing the sky. That would have made a good picture, but I didn't have my camera with me. If you want to see some really good pictures and find out more about the chemical contrails that we are being sprayed with, check out the web page at: www.carnicom.com/contrails.htm or see the other links below.. This picture didn't come out too good because of the sun. But right in the middle is a very thin line where a fresh one was being added. I could just barely see the plane as a tiny speck in the sky. Above the office and warehouse building. Here's more over Bunch and south of us, over the area near Sallisaw, Oklahoma. This was on Dec 30, 1999. 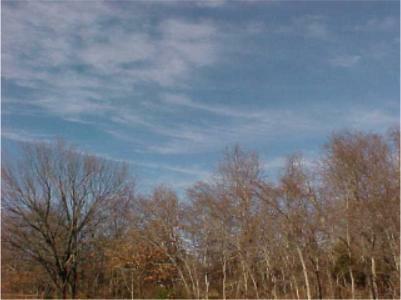 After they have dissipated awhile they begin to look like normal clouds (but they're not). 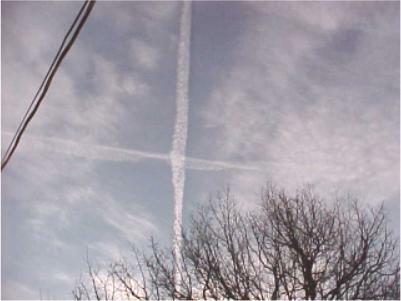 "X" marks the spot. These are pretty much directly above our location. Ten minutes later these had dissolved where they too looked like a "normal" cloud string. These were taken as I went to work at 8:00AM. They (whoever?) were busy this morning. When I took these pictures I was able to count at least 10 distinct chemtrails and there were also a bunch of "clouds" that were suspiciousI feel they may have started out as chemtrails and had already dissolved beyond recognition. We are apparently getting a good dose today (Feb 3rd), all these before 8:00AM. 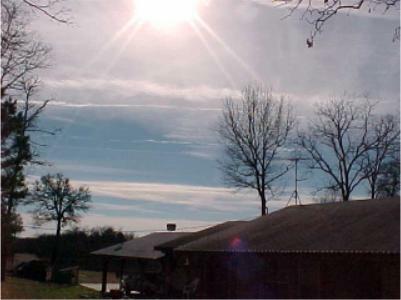 Annie and I went to Tulsa later that day and there were chemtrails all the way. On the drive up, around 2PM, I noticed the two planes stop straying and turned to the general direction of Oklahoma City. I assumed they were going back to Tinker AFB for fueling and reloading. On our drive back they were still spraying at 6PM as it got dark. Here's a fresh one being laid down. 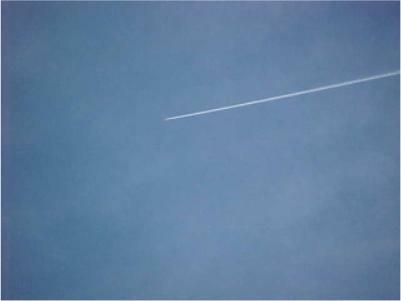 I could see the plane (barely), but my digital camera didn't have enough power to pick it up even at full zoom sorry. This one was about 8:45AM (2/3/2000). 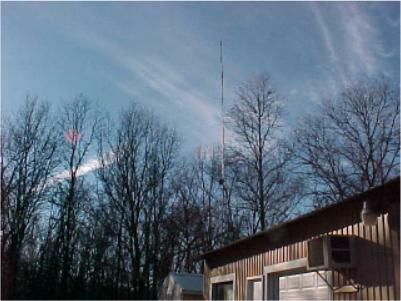 Here it looks like a, more or less, normal contrail, but wait a few moments until it has a chance to start to dissipate. I wonder if we will ever find out what we are being sprayed with, why, by whom (officially), etc? When will it end? Will we be glad that this happened, or horrified? 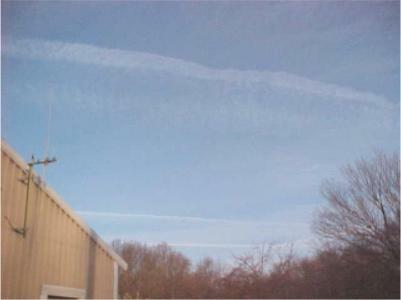 Latest (4/9/2002): I have recently noticed that Chemtrails are showing up on TV and movies. Recent truck ads by Ford and Chevrolet have both had ads where the truck was shown with the sky in the background and I noticed clearly visible Chemtrails. But if you blink, you miss it, and it is not repeated later in the ad. Then I started watching the Kevin Costner's movie, "3000 Miles to Graceland" and near the beginning on the movie they had a sky over Nevada scene with a Chemtrails painted sky. Again, don't blink. Now I have to wonder if Chemtrails have gotten so predominate that you can't get a good sky scene without there being Chemtrails. Or is this Hollywood's way of getting us used to seeing Chemtrails as "natural" phenomental?